We are using unique chip structure which offers high light-extraction efficiency, high power, low thermal resistance, and excellent reliability from the most famous brand at the market. This chip structure along with many years of refining the manufacturing processes, enables us to produce high performance light. We always source the LED which belongs to specific color Bin to achieve uniformity of the light. Since no two humans perceive color in exactly the same Way. For that matter, an individual’s perception of color varies over time. So how can we come to an acceptably uniform? What is the definition of color from the human eye’s perspective? 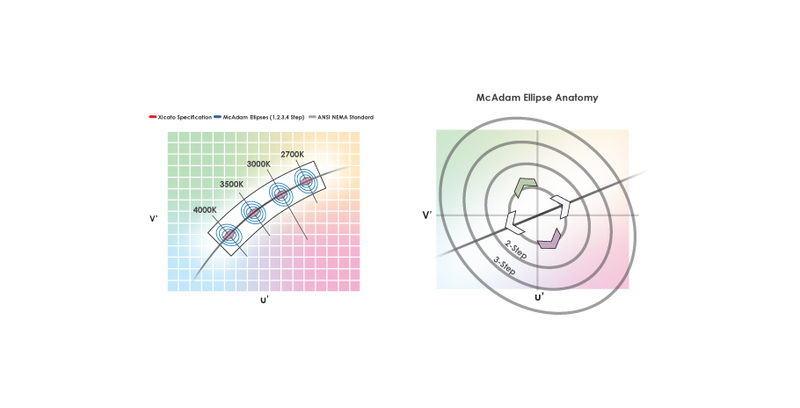 As per Macadam standard in step 1 is impossible to recognize the color variance. In step 2 -3 is hardly noticeable and in step 4 the color variances is noticeable. H.S.I is always pick the LED with maximum 3 Macadam’s steps. 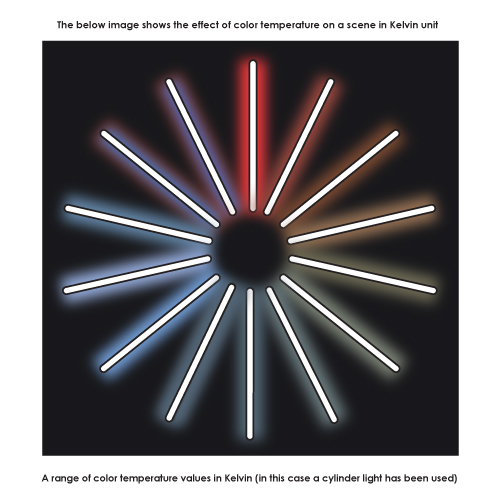 efficacy could be varied for different correlated color temperature. The appearance of light color both in terms of Chromacity (CCT) and color rendition (CRI), are important in the overall feeling of space. Therefore designers should consider both Chroma city and CRI as key components of a design. Along with the usual efficiency and long life, Color Rendering Index is a major factor to justify the LED light quality as well. Which defines color quality of the LED. In simple word CRI is bulb’s ability to make reds, greens, and all other shades look just the way they should. 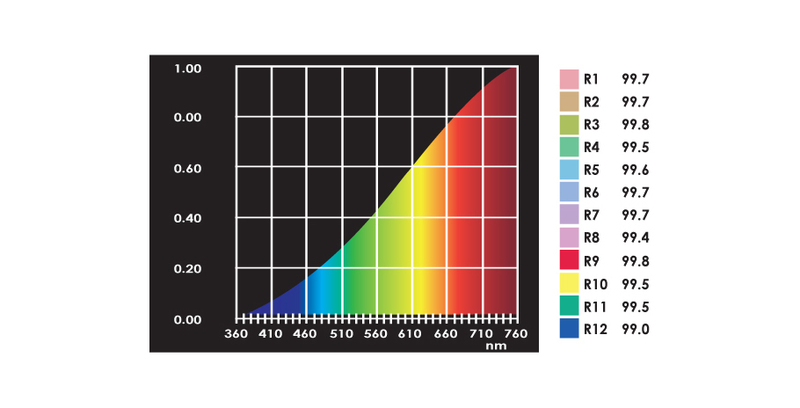 A bulb's capacity for producing correct-looking colors is measured by its score on the color rendering index. 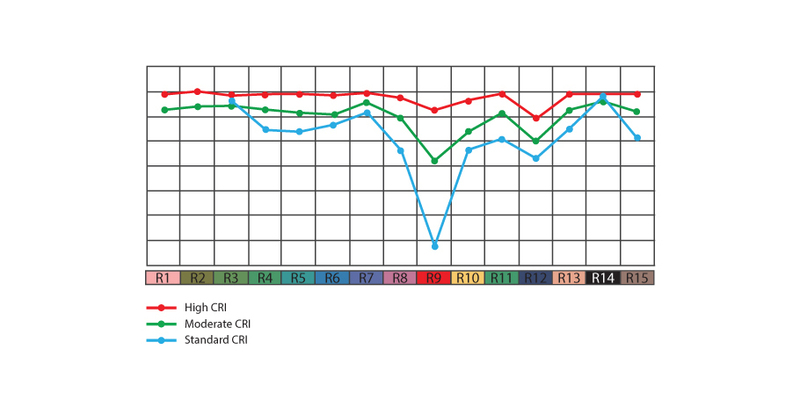 This figure, usually referred to as the CRI number, is a score out of 100. that actually averages several scores together, each one for a different color. 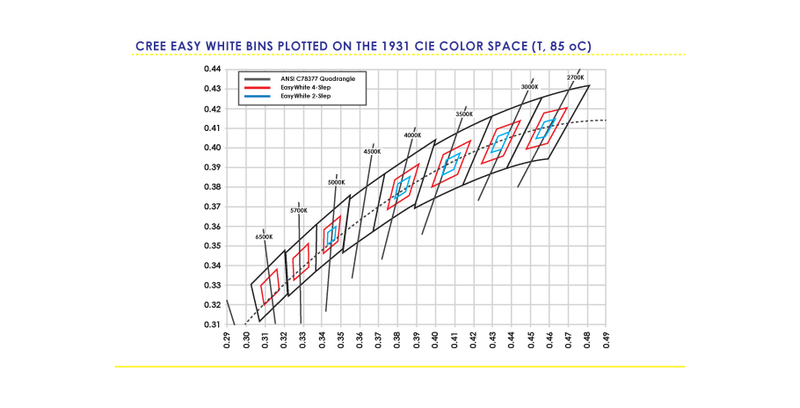 A high CRI number is like a high grade point average for color quality. 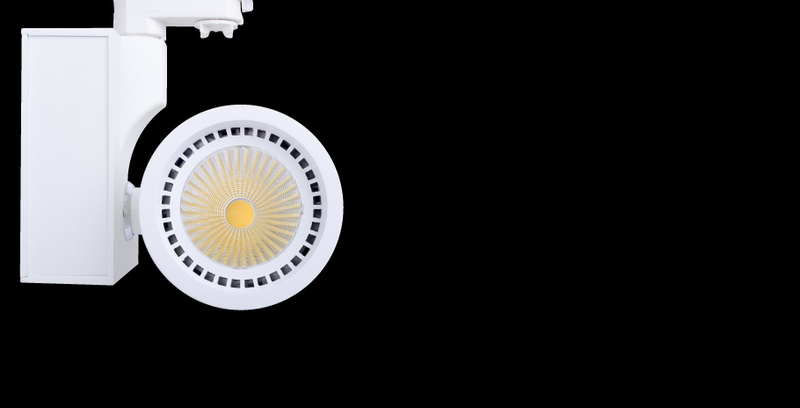 These score drops by getting the higher color temperature, for example the CRI of 6000 k technically will be lower than 3000k for same LED series. When CRI is measured, the light source is tested against the first 8 (of the 14 possible) pigment color samples only (R1-R8). The current CRI scale does not cover the strong reds (R9) that are prevalent in skin tones, art work, clothing, and grocery store produce. The available color temperature from warm to cool white beside of high CRI in HSI products, enable designers to create the lighting mood and different ambiances that enhance costumer experiences.